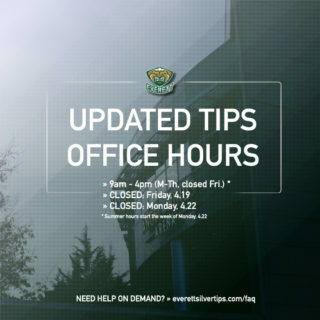 TIPS WIN // Blazin’ Hot Silvertips! 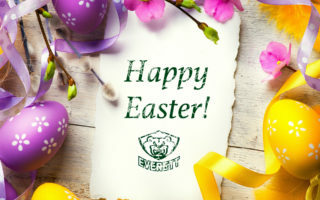 KAMLOOPS, British Columbia – Gianni Fairbother dished a career high four assists and the power play tied a franchise record with five man advantage goals as the Everett Silvertips cruised to a 6-1 victory over the Kamloops Blazers on Friday before 4,973 fans at Sandman Centre in WHL action. 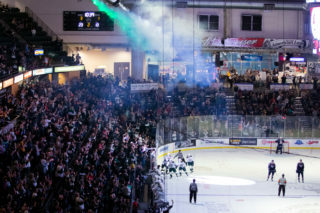 The Tips began three games in three days – a sequence of visiting Kamloops, Seattle, and back to Kamloops – with their seventh win in nine road games. Akash Bains scored twice, Sahvan Khaira chipped in with a pair of assists, and the Tips outshot Kamloops, 36-14. 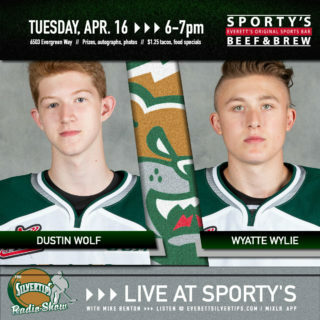 UP NEXT: The Silvertips return to play on Saturday in Kent, Wash. against the U.S. Division rival Seattle Thunderbirds (1380 AM / 95.3 FM / Tips App / WHL Live), underway at 6:05 p.m. 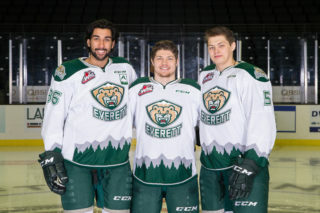 The Tips return home Nov. 14 against Portland at 7:05 p.m. Tickets are available at www.everettsilvertips.com/tickets. The Tips, scoring the first six goals of the game, raced out to a 2-0 edge after one period on a pair of power play goals. Sean Richards buried a snap shot from the left circle on Dylan Ferguson at 4:02 and Akash Bains boosted the lead to 2-0 at 12:09 on a deflection between the circles off Fairbrother’s pass. Bains slammed a rebound into a half open net for a 3-0 lead just 1:41 into the second period, and the Tips finished off their run on a stretch of three power play goals in a span of 1:26. Jake Christiansen parked his fourth goal of the season from the left point, a two-man advantage goal at 9:06 and Jackson Berezowski buried a rebound at the left post at 9:32 for a 5-0 cushion. Riley Sutter then tucked a rebound at the side of the right circle, 10:32 into the period, and forcing Kamloops to pull Ferguson for rookie backup Rayce Ramsay. While Ramsay made 14 saves in his WHL debut, and Ryley Appelt’s rebound goal at 2:01 of the third period closed the scoring. Wolf, replaced by Max Palaga to begin the third period for rest, made six games in two periods. Palaga, making his Silvertips debut, made seven saves on eight shots. NOTES: Silvertips scratches include Blake Lyda, Ronan Seeley (World U17 Hockey Challenge), Peter Melcher, Conrad Mitchell, Dylan Anderson, and Bronson Sharp … the Tips have twice tied their franchise record for power play goals, both against Kamloops … they have 13 goals in two games of the season series … Artyom Minulin made his Silvertips debut and recorded an assist on Christiansen’s goal.